The last time I was here I waxed poetic about midcentury modern style, and you might be eyeballing the graphic above thinking, "PAIGE, you're doing a repeat, I've seen some of these chairs on Mad Men." And I'd say, yep, you did, because a lot of these designs were big in the 60s. (Heck, most of them have never really fallen out of favor for people who dig modern styles.) Interestingly though, all of these were first designed and manufactured between 1919 and 1933 as part of the Bauhaus era. 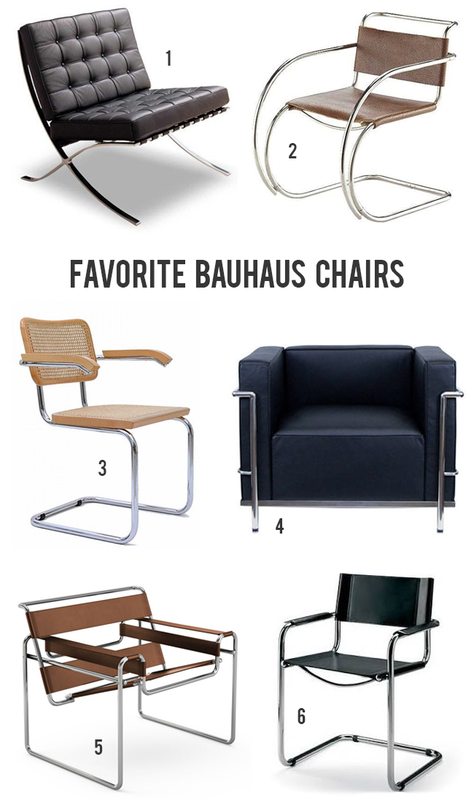 Before I get all googly-eyed and start drawing these chairs all over my notebook like an 8th grader, let me dust off my design school knowledge and tell you a little about the Bauhaus in general. It was an art school in Germany, started as the country was recovering from World War I. The major design philosophy of the movement was very no-frills: the marriage of form and function was an aesthetic choice, but it also helped stimulate the ol' economy by keeping the pieces affordable for the middle class. Simple shapes made mass-production easier, as did the use of all of that metal tubing. These chairs hit the sweet spot of being well-made, yet wallet-friendly--which makes me jealous because THESE days getting a real one is... not. Thankfully, there are some good knockoffs afoot, because if I spent $5,000 on a chair it would be the only thing in the room. How can I teleport into this dining room and claim it as my own? The chairs are obviously wonderful--a great knockoff version is at Restoration Hardware--but I also want to point out the Advanced Texture Mixing. Marble, and caning, and grasscloth, oh my! I love me a Barcelona chair, which is what this splendid marshmallow is called. (Knockoff is here.) I don't know where this apartment is, but I've decided it's Paris and that I would spend my afternoons lounging in a sun puddle, maybe reading a book, maybe eating some chips. Whatever. The fancy chair would make me feel chic no matter what. That Barcelona chair is awesome, but I wouldn't be able to afford my home anymore with a splurge like that. But it looks wonderful, I would guess the apartment is in Paris indeed. I would get me some macarons and watch chic Parisians walking by! I wish I had $2500 to spend on number five because it is perfection. I love this style! It is sleek and funky. They don't look comfortable though and comfort is important. 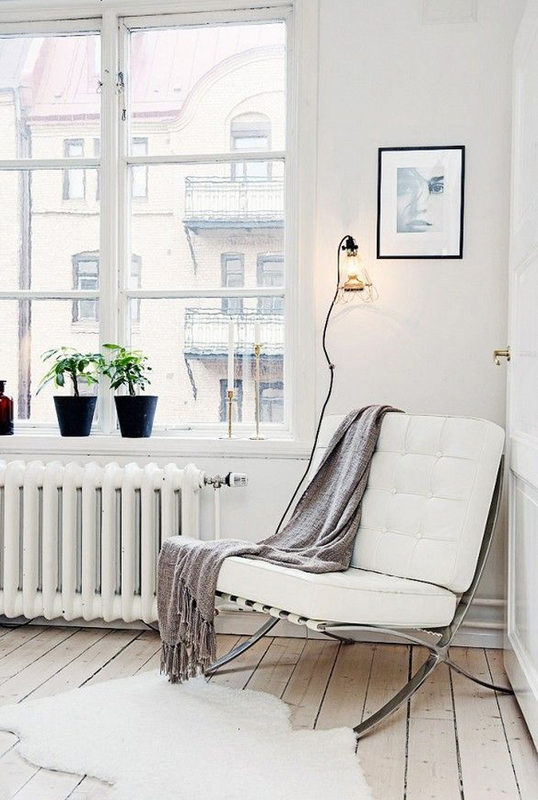 The Barcelona chair however does look cozy! Drooling over all of them! In my first apartment I had two chairs like #6!! !